Picking the right tire for your car will add to both an enjoyable ride and the safety to the driver and all passengers. When you think about it, they’re the only thing between you and the road. Tire become unsafe when the rubber starts to where down. And there are several reasons why tires tend to wear down. Everyday driving will over time begin to wear down the rubber. Whether you drive locally or on long distance trips, everyday use will start to affect how the tires grips the road. The tires on the front of your car will wear down differently than those in the back of your vehicle. This is because the front tires more or less lean into turns as you are taking corners. This puts pressure on the tires differently than your back tires. Your back tires will wear out more evenly. So to prevent your tires from wearing out faster than they need to, therefore lasting a lot longer for you, your Chrysler Dodge Jeep Ram service mechanic will rotate your tires when you come for an oil change. Every make and model is different, so we suggest you check your Maintenance Schedule. However, for most cars we recommend rotating your tires on average every 7,500 miles to save the tires from wearing out unevenly. Brakes should be checked when your tires are off because it’s easy to see and reach them. 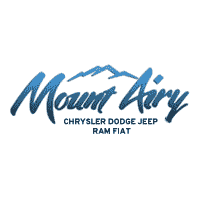 Here at Mount Airy Chrysler Dodge Jeep Ram FIAT, our Tire Center is unique because we buy tires for all of our auto dealerships in North Carolina. When you buy at such a high volume you get better prices. And we want to pass those great prices on to you. Please call our service department and let them know what size and type tire you are looking for. We can be reached at (336) 673-3471! WE GUARANTEE YOU WON’T BEAT OUR PRICE!